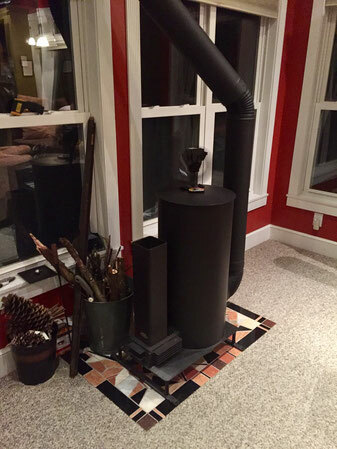 "We've been heating with our Rocket Heater all winter, and couldn't be happier. To be honest, the only gripe we have had - if you could call it that - is that the 1500 sq. ft. the stove is heating gets into the 90s easily. With ceiling fans, we're able to heat the basement and attached garage to at least 20 degrees above ambient. We cannot stop raving to anyone who will listen about how much we love our Liberator"
"Hi there. 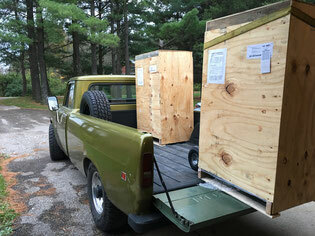 Just wanted to say thanks so much for the quick crating & shipping of my two rocket stoves. As I mentioned earlier I have one of your stoves with the pellet hopper working in my house up the Taku River. I have a wilderness lodge there that I own, but no longer operate. 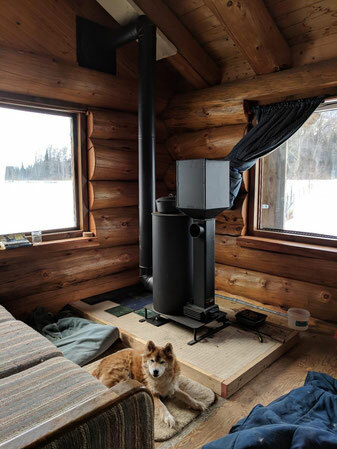 I provide my own power (Efoy fuel cell generator, and Honda EU 2000i fitted up to run on propane), so finding a pellet stove that works so well with-out electricity was pretty awesome. 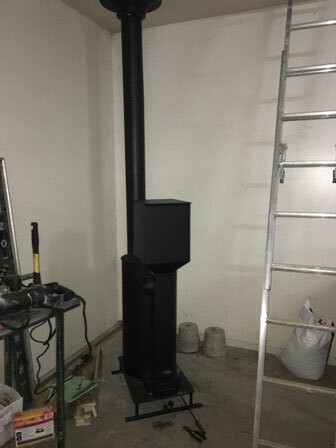 The new stove will be used to heat water for the house, well and provide a little extra warmth when I'm not burning pellets. Know this is totally aftermarket." 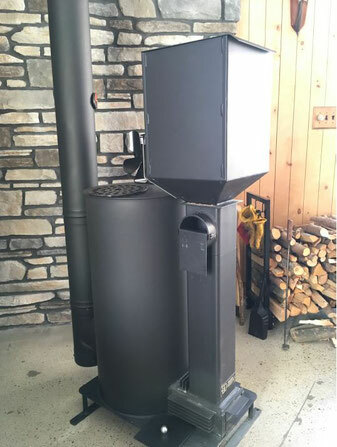 "I bought the Rocket Stove to use in a house on my property yet to be built. In the meantime, I let some friends use it as they had no heat source in their trailer. It works awesome! They are very warm at 84 degrees in the winter. The hopper for pellets works great. My friends were very skeptical of my choice, but were pleasantly surprised at how well it worked! We were all impressed at how well it is made and the care taken to ship it. Thank you sooo much for your awesome business! I will be spreading the word." 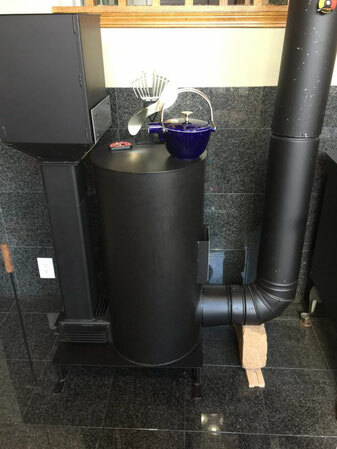 The Company that I contacted to install the stove challenged me about installing a rocket man stove and tried to convince me to purchase one of his stoves. I revisited the Liberator web site to review the characteristics of the stove and ended up sending an email to Sky with several questions about the stove. Sky was quick to get back with me and invited me to call him to discuss any of my questions or concerns. I called him and spent over 30 minutes going over my questions about how much heat the stove put out, the longevity of the stove, and its overall operation. He was very knowledgeable and did an excellent job of explaining to me how the stove worked and convinced me that this was the stove for me. Once the stove arrived and we got it installed, I got my first fire started in the rocket stove. Following the lighting instructions from their website video provides a full proof way to get a fire started and drafting quickly. I really was impressed with how quickly the stove heated up. I have quickly learned that the stove much more prefers 1.5 to 3 inch wood in the fire box. I split most of my wood this summer to 3 to 4 1/2 inches thinking it would fit down the 5 inch opening. Although I have had to go back and re-split some wood, it’s not a big deal and the stove burns more efficiently with the smaller pieces of wood feeding down into the firebox. Some people might see this as a negative, but the stove actually burns considerably less wood than other wood stoves and in the end I think the effort evens itself out. After using split cordwood and other small scraps of wood that I had saved from trimmings over the summer, I decided to try out the pellet hopper. I bought four different brands of pellets at a local store and began running tests with the stove. The first test of a whole bag of pellets lasted around 10 hours. The last couple hours of the first test I decided to use the pellet shut off plate as a way to dampen the air intake. My goal was to reduce the amount of oxygen and extend the burn time for a bag of pellets Without reducing the amount of heat being produced. I used the exhaust temperature as a way to determine this. The stove running completely open ran at 200°F consistently. Even after reducing the air flow into the stove to 50%, the stove continued to run at 200° exhaust gas temperature while providing even heat for over 11 1/2 hours. 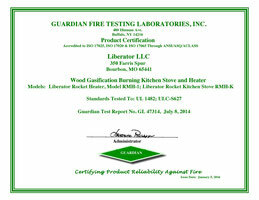 Of the four bags that I tested, I did find one brand that did the best in my stove. The Lignetics Premium Quality (PFI RATED) outperformed the other three brands. I have fine-tune my damper control to the point where I now get 12 hours to 12 hours and 15 minutes burn time from one bag of pellets with consistent exhaust temperatures of 200°F. The ability to load the hopper up with pellets and enjoy 12 hours of consistent heat is amazing! The stove does a great job of keeping the majority of our house warm. We live in a 2000 square-foot a single level home. The stove is located in our south facing sunroom. After the stove is running for about two hours, the sunroom will easily reach 76° with the outside air temperature right now being from 31° to 18°. The stove is able to heat the living room and master bedroom which are the farthest away from the stove to about 62-63°. This actually works out great for us because we set our thermostat for 63° from 9 o’clock in the morning until 5:00 and after 10 o’clock in the evening when we go to bed. Overall, I am exceedingly happy with the stove. It provides me with flexibility and deciding what type of fuel to burn in the stove. When I am home and available to feed wood into the stove, then I can use the cord and scrap wood that I’ve saved. On days when I’m busy or will be out of the house for a while, I can use the pellet hopper and ensure that the stove runs for hours of uninterrupted heat. Now that we have been using the stove for a couple of months, my wife has stated that she really likes this stove and enjoys the heat it provides. She also thinks it looks great in our sunroom. The chimney sweep that installed the stove has come back to see it in operation and is becoming more and more interested in it and of course he loves my enthusiasm for the stove. "Finally got to install your stove. We were vendors at the Richmond VA NPS show. Stove replaced a propane stove that could cost as much as $1000 per month with heavy use (so we just didn't use the room in the winter) Your stove is doing the trick. Going to build a pebble style bench for it this summer. "The heater works great. 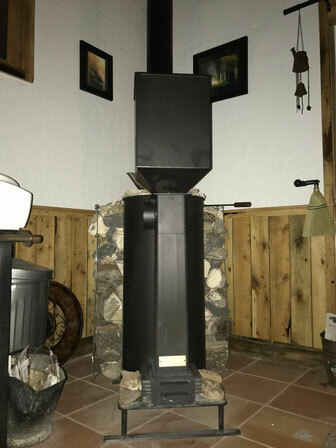 We purchased it to replace our old coal stove and its doing quite well." "We have continued to use the rocket heater over the winter. We haven’t optimized everything yet but all in all we are happy with the stove." A few months ago I purchased two stoves from you. Here are a few pics of my just installed rocket stove. Works great, thanks again. 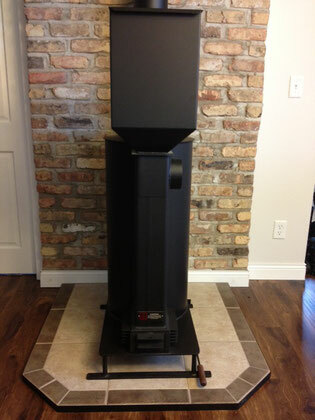 The other stove I purchased will be installed in the future." Just a thank you for the stove I bought last winter. We had no power most of the winter so the stove we bought from you was our main source of heat, hot water, and a good part of our cooking for the coldest part of the year. It works well. I did buy a heat operated oscillating fan to help move the heat through the rooms we were heating. We re getting ready to move into a different home and believe me the rocket stove is moving with us. This will be a smaller home so it should be even more efficient. We can easily get _10 to -20 on our coldest nights. Usually we just heat an area where we prepare food and eat, and a bedroom/ bathroom area. The new home is pretty open so we will hope the rocket stove is up to the task. 16x56 1 bedroom, 1 bathroom with an open room that is kitchen, livingroom, and dinning area. Lots of double pane Windows with built in storm Windows. Well insulated. A perfect home for great grandparents living alone. Plenty of room for guest in livingroom. We have new burn grate designs that alleviate the need to replace grates annually. Thank you for your feedback American Redoubt! "I’m impressed with your build quality! The heater runs and acts mostly as you have advertised. 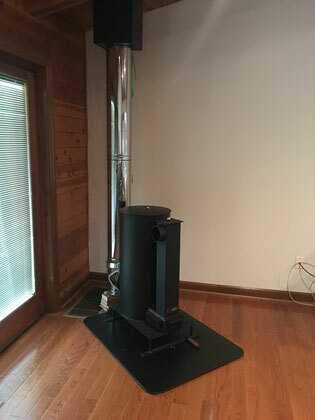 I like there is no moving parts and quieter vs my old electric pellet stove I had for 11 years even though I had no real issues once I got it dialed in. So far I’m fairly happy with it and would give it a score from 1-10 a 7, my old pellet stove I would give it a 6." "The stove has proved itself under very trying conditions. We have had 65mph wind gusts here on and off for the past 3 weeks. This, as you know, makes it difficult to maintain a steady draft. Even my beloved Ashley could not keep a draft established and would puff back. Your stove has not had even a teentsy puff back, with the wind howling around the house. The house here, sits in a difficult place because of the surrounding terrain almost funneling winds from a saddle in the mountains to the west right over the house. It's great for breezes in the summer, I always have a little bit of a breeze here. But for burning wood in the winter, it's not ideal at all. The winds tend to get very high here in the fall and spring and that creates serious draft issues. I removed the fireplaces the house came with as totally useless and worse. The winds would come down the flue and there would be ash all over the room. I have used a Vermont Castings Defiant stove here but found that it couldn't adequately heat the square footage of this house. I got the Ashley circulator type stove and used it for 7 years here. Every stove I have used here but yours has had draft issues occasionally. The stove I built wasn't in place long enough to test it for draft issues. I knew within a week that I wanted a rocket type stove. I have been heating with wood for over 40 years now. I just know that I can not physically cut and haul firewood anymore. Purchasing firewood is not financially feasible either now. So, I was forced to look for options. That's when I found rocket stoves and started experimenting with them to see if that type of stove could meet my needs. I build several rocket stoves, because I knew that I could not have a mass heater in the mobile home that I live in, due to weight considerations. So, I kept researching and trying different setups and finally built a rocket stove on the hearth in the living room. 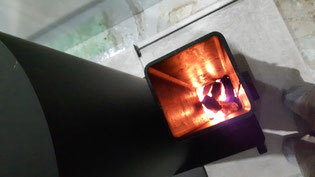 I tested it for a week and knew that I wanted a rocket stove. I had looked at your stoves quite a while ago, but couldn't justify the expense without knowing that it could actually heat this house. I kept going back to your website and looking at the stove as I learned more about rocket type stoves. The Liberator is well made. 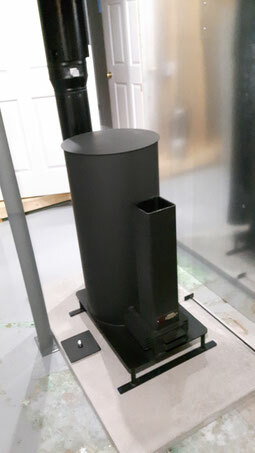 It is solid and is not going to burn out ( as some of the information about rocket stoves says a metal riser will burn out) I don't NEED to fire the stove to 2700F to heat my house. So far, the stove meets or exceeds my expectations while at the same time looks great and is an instant "oooooooh... what IS that??" , from everyone who walks in the door. I have neighbors who have followed this process for over a year now and can't wait for the first briquette firing of the stove. We've sat and had dinner and been amazed at the amount of heat the little guy puts out. The Ashley was a big.. er.. large for the space and dominated the area completely. The Liberator puts out more heat with less than 1/2 the footprint or presence. I can hear the rocket song throughout the house if I listen, so I always know when the stove needs to be checked for fuel. It's not invasive, but it is a low-key rocketsong that I have become familiar with so I know when it needs attention. The stove sings to me. And certainly, you may use any or all of my comments. I would love for many, many more people to discover this stove. You guys do quality work and the less smoke there is in the world, the better for us all. I have tried to smell the stove when it was running. I went all around the house, smelling. I couldn't smell any kind of wood smoke aroma, couldn't see any smoke at all. I had friends stop at the house to make sure I was ok because there was NO smoke coming out of the stack. Before, they always knew I was at home and the stove was going because of the smoke. They were concerned because it was cold, pretty darn cold and there was no smoke and they knew I was home. Should have seen the looks on their faces when they came inside to a snug and warm house with no smoke at all from the stack. They sure looked the stove over and that was the day it was delivered. I had the stove on the hearth and running the first day, and did it myself. There ya go... the beginning of the Liberator saga. The why's and wherefore's of my rocket stove adventure." "I wanted to take a moment and share my experience with Rocket Heaters with the hope of saving others time and wondering. I recently purchased a home in rural Ohio and wanted to avoid the high cost of Propane and time dealing with propane service providers. 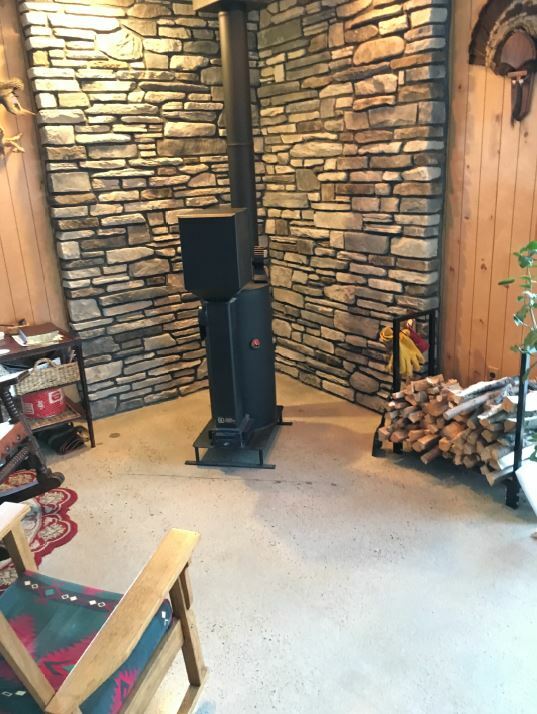 The home had an old wood stove in the garage, but after 2 back surgeries I just couldn’t get excited about bending over to pickup wood and stoke the fire every hour. Cold mornings are another downside of wood stoves that I wanted to avoid. Without the option of natural gas, I researched every available option including geothermal ($30k) as a way to reduce costs and effort of keeping my home warm. After 3 weeks of research, I settled on rocket-style heaters as the best option. There are two leading brands of rocket heaters. 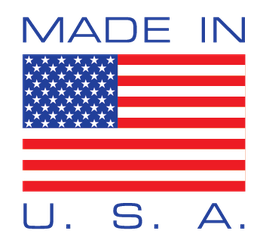 I chose The Rocket Heater because they are the only option, which is designed AND manufactured in the US. That means I can go directly to the source if I have a problem. I bought one for the garage 30x50 and one for my 2500sq home. The first thing I saw on delivery was the quality of the shipping crate. It definitely didn’t come from China. Secondly, the materials, paint and welding are top quality. I felt like I actually had a chance of getting what I paid for. After first fire up, I noticed that heat they produce is very steady. The temperature hits 500/550 degrees within an hour and stays there. There’s almost no fluctuation of heat. Two 40lb bags of pellets last 18 hours. Cleaning takes less than a minute with the rake provided and re-starting with a propane torch also takes about a minute. No smoke or smell of fire in the house ever! Burn box is low to the ground, but necessary for the draft design I suppose. You have to wait a few days, no local retailers yet. After a couple of months of usage, I just don’t see a better option. The gravity fed design runs flawlessly for hours and seems it’s never going to wear out!" 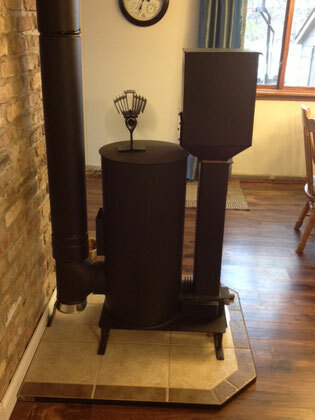 "I used double wall pipe all the way to the stove to reduce hearth clearances and hearth size. Test-fit photo." We are loving our liberator in the frigid Idaho winter (see pic). I just started using wood chips and loved how the heater performs with them. "Thanks for the new burn grate. The stove is "grate" and we love the heat it gives! We all stay in the living room around it in the winter. Below is a customer review of an early prototype! Special Thanks to Farm Show Magazine for this excellent article below! Be sure to check out Farm Show Magazine, lots of great stuff in there. 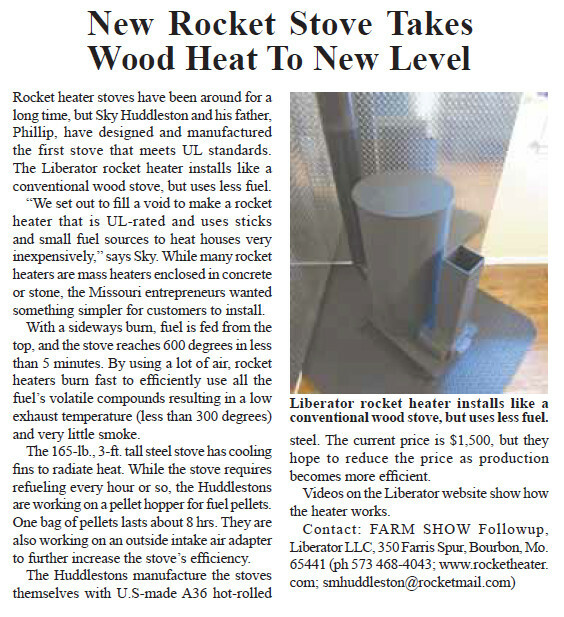 Below is an interview of Sky Huddleston, COO of Liberator LLC, by Lisa Myers of Rebates Zone. 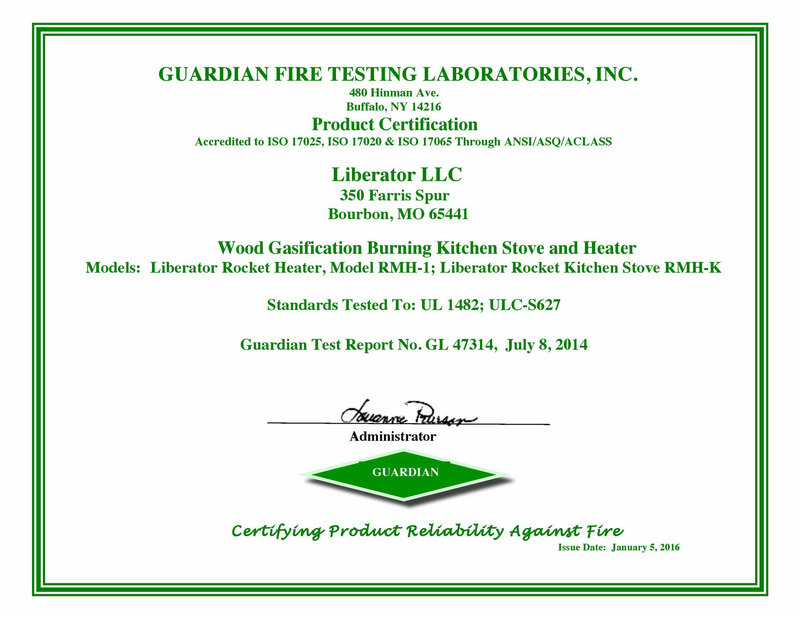 Below is our official listing certificate as having been tested to meet and exceed the safety standards in UL-1482 and listed by a NRTL as such!